Die deutsche Version dieses Reviews kann im Tacticalforum nachgelesen werden. 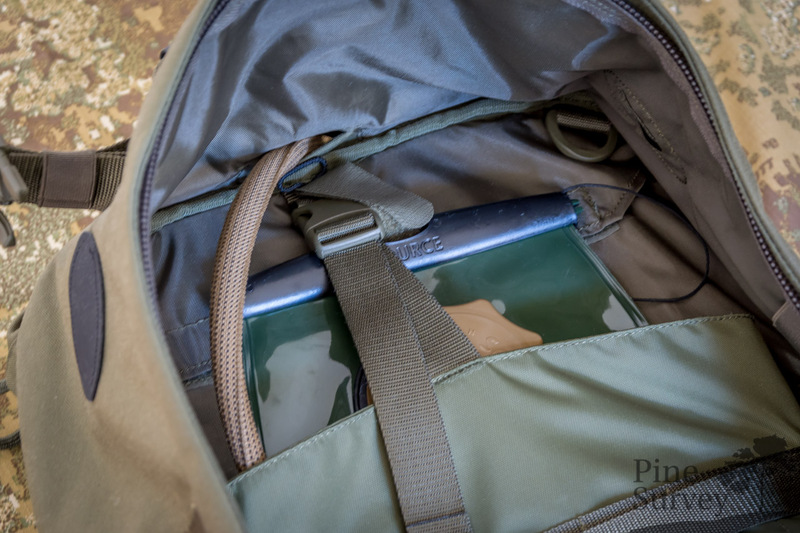 Last but not least I am finally able to present my third and last review on the Tasmanian Tiger Bug Out Pack to you. The first and second part can be found here and here. In this last article I would like to focus on the workmanship, my personal experience with the pack as well as my final conclusions. Insofar I will be going straight in medias res and spare you and me a lengthy introduction. 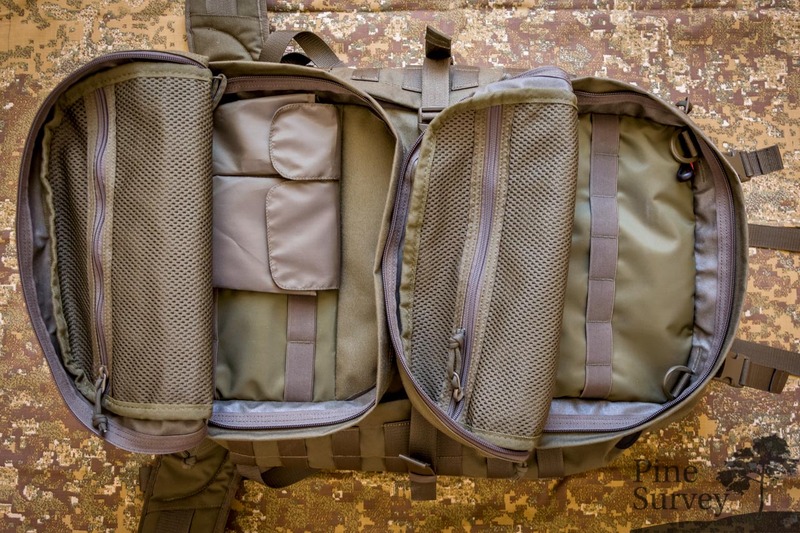 As expected from Tasmanian Tiger, one can only find high grade materials being used for the Bug Out Pack. 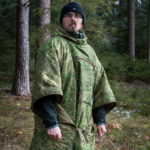 700den Cordura serves as a guarantee for the pack being not too stiff, but also not too flabby while providing the necessary strength to survive a beating. The webbing is high grade and matched accordingly to the color of the pack, as are the buckles on the pack. the latter are being produced by Woo Jin, meaning that they are high quality. The zippers don’t display any company markings, but are massive in size depending on the locations on the pack. At this point I have to add a remark: I was told several times now that the zippers by Tasmanian Tiger tend to loose the gripping plate of the Zipper slide, because the hook on them tends to bend. Until now I never had this particular phenomenon – with the Bug Out Pack I had it on two instances though. In my honest opinion this can happen with every zipper and is not an issue which can be solved by a multi tool and some paracord. Let us take a look at the seams. As I have shown in the previous review one can find massive reinforcements at the stress points of the pack. On the one hand there are bartack stitches and at the other hand even additional webbing placed over the vulnerable areas. The quality control of Tasmanian Tiger worked exemplary again and I was not able to find a loose thread, a crooked seam or other negative aspects in regard to workmanship. As with other products of Tasmanian Tiger the excessive use of seam tape adds up to a high quality feel and clean manufacture. At last I have to mention the use of Hypalon, which has very excellent haptics at the carrying handle but which also serves as a protection of the various slot openings for cables and tubes. So let’s come to my personal observations. 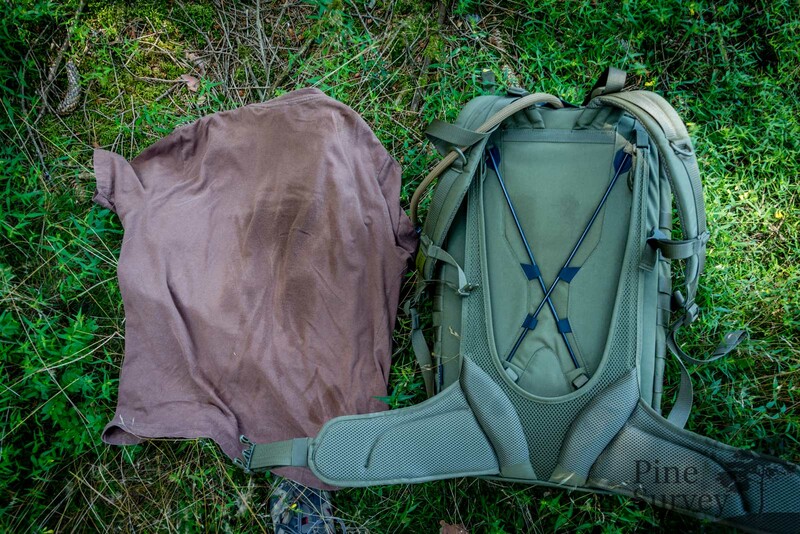 The backpack was being used for over half a year now – during temperatures between min. 15°C and max 36°C. In that time it accompanied me during train rides, car drives and of course during my trips in the forest, escaping the ig city and doing my camo reviews and private marches. 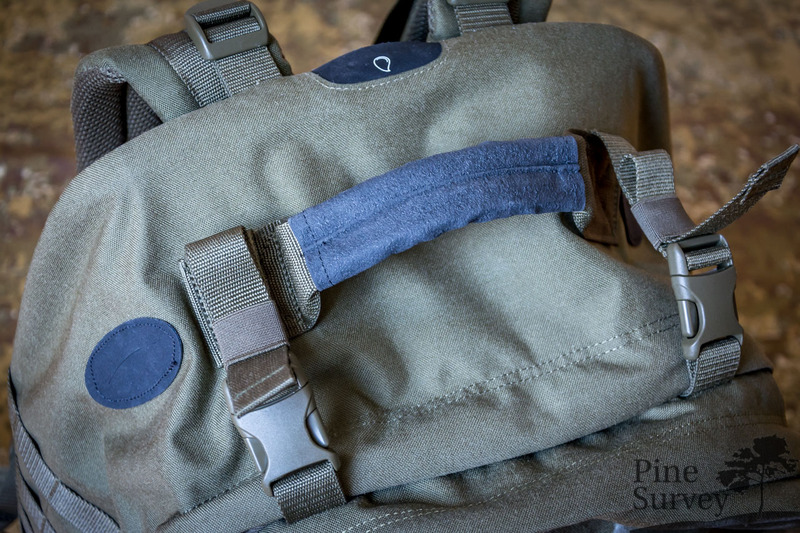 Shoulder straps: These are relatively close to each other at the topside of their attachment points, which could result in possible chafe points for the user. 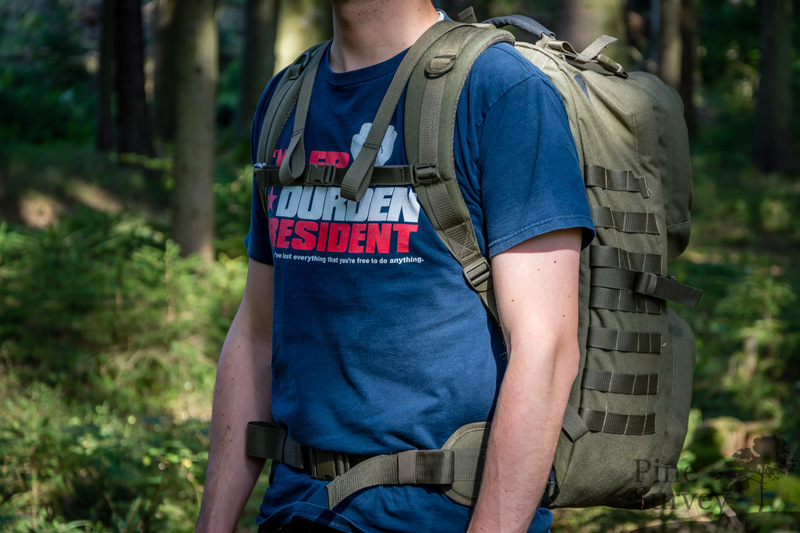 In this regard the height of the user plays a significant role – the taller he/she is the less problematic the issue gets, because the pack sits lower to the hip, where the actual weight should be directed to in the end. With my height the threshold was reached at which the issue did not result in a major problem. Hip Belt: Again body figure comes into play. Because of the fiberglass sticks, which distribute the weight to the hip, the hip belt itself is being stopped at the rear side to bend completely around the body of the user. A small free space is being generated at 4 o’clock and 8 o’clock with the result of full contact only at the front and back. Everyone with small hips should be aware of this. At the same time this issue has the side effect that the hip belt cannot be completely but away during transport – as mentioned in the second review. To give you a better idea I will give you my body specs that I had during the time of taking the pictures. Height: 180cm, weight: 74kg, size 33”. Air circulation system: In a word – a dream, although with a “but”. The opening of the mesh net at the backside and the possibility to force the backside of the pack away from the user by using the framesheet and the straps of the x vent plus system, do have the very comfortable result of a relative sweat free environment. During this years hot summer I really learned to appreciate this. The user has to put up with a trade off nevertheless: The more you force the backside into its concave shape, the more you loose of the internal packing volume, because the dent is directed inside of course. Meaning: the free space that you gain at the back you are loosing in the pack. So you have to find a balance in adjustment, especially if you are carrying heavy equipment in your internal sleeve inside the main compartment. Of course the load distribution system can be completely be relieved and the pack carryied close to the body. I also tried this although I have to say that the opening of the mesh net acts disadvantageous this way, since you grab into the fibre glass sticks from time to time, especially when the pack is being overloaded. Another thing that happens is that the framesheets bends towards the user, pushing the fibre glas sticks into the back of the user in doing so. On more than one occasion I had to push it to shape with my knees again. Air circulation is lost in such a case and the following picture shows how the backside of my back looks after 4km in 34°C. At the same time you should recognize that the areas of the meshnet did not let any sweat reach the shirt of mine. Insofar a meshnet over the whole area of the back could be a possible alternative in this particular case – but I leave that decision to Tasmanian Tiger. Adding some other observations: The design of the pack is thought through and practical. Not too much and not too less. Me personally I don’t need too much internal organisation possibilities and admin panels. 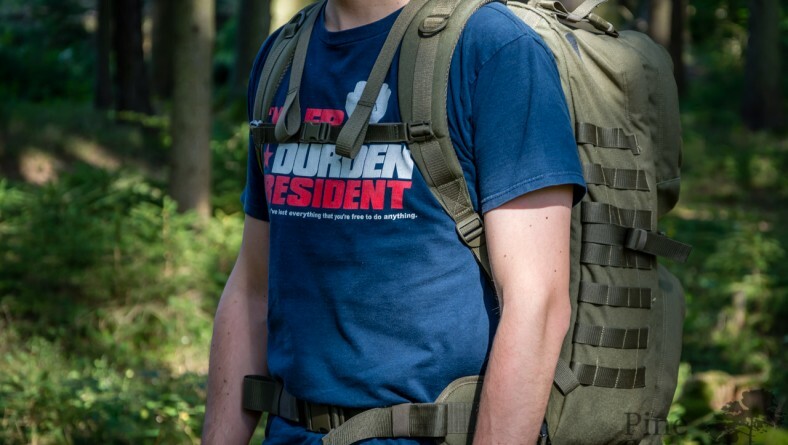 In that regard one can find a nice balance in the Bug Out Pack. The size of the pack is close to the limit in my opinion when it comes to a clam shell design. It must not be bigger, only because it would be bursting at the seams while overloading it – speaking figuratively. Especially the front pouches make the closing process harder when packed heavily – but this is a question of matter of habit I suppose. The depth of the pack is a story of its own though. Fully loaded it stands up/over to 34+cm from the back of the user. Depending on the height and the first and second line of gear, the user gets a very large silhouette, which can be a disadvantage in close quarters. Especially when it comes to fast movement around corners – here you have to be aware of your surroundings. The internal sleeve on the backside of the main compartment, in combination with the framesheet and the peculiarities of the X Pack Vent System are being seen a little bit skeptic by me. Here you definitely have place for a large radio and/or several water bladders. 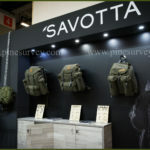 Because of the way it is designed you are able to fold and tie it down effectively to use it as a MOLLE panel. Nevertheless I still have to figure out if it wouldn’t be better if one could detach it completely if needed – again this is a subjective question of habits. A small detail has to be criticized though. 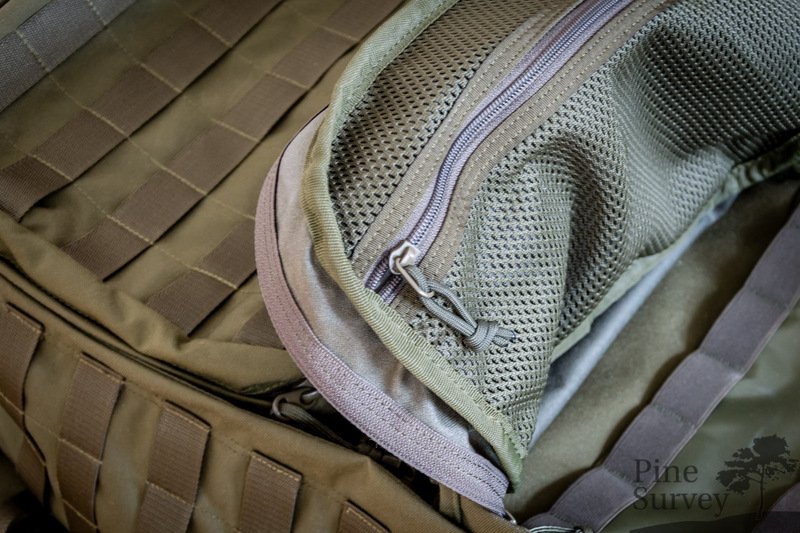 The velcro loop for the water bladder is positioned above the buckle, which adjusts the internal sleeve. If you want to attach the bladder, put it in the sleeve and secure it with the buckle, both contact points are in each others way. Long story short, the velcro loop needs to be under the buckle, not above it. 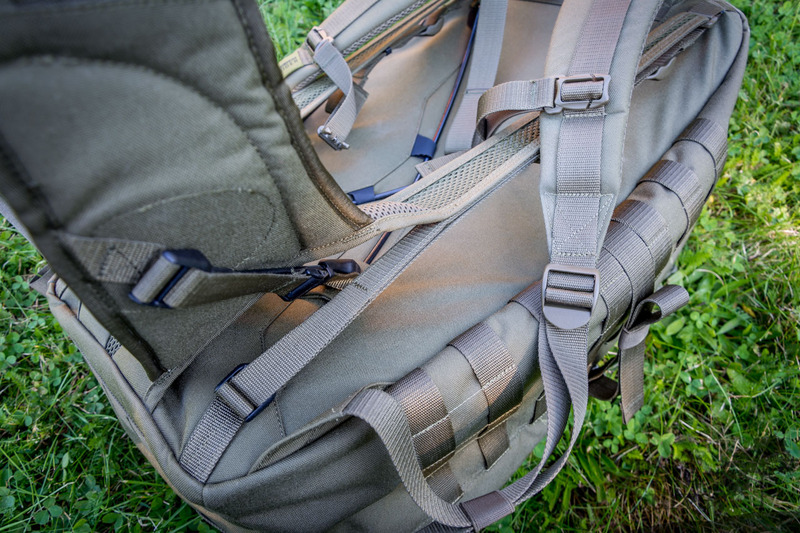 So what can I tell you after half a year of use and two preceding reviews about the Tasmanian Tiger Bug Out Pack? The concept of the backpack is more than interesting. The area of use however is still not completely clear to me. 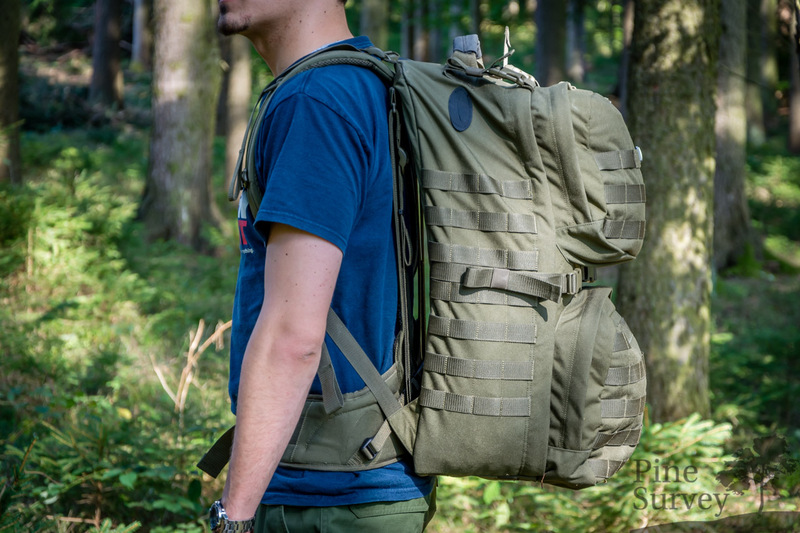 Of course the name carries enough meaning and I have to say that the pack sure is useful during fast escape, as long as it does not contain long marches. For longer tours I would prefer different packs from Tasmanian Tiger. Even if the load distribution system works perfectly, it only does so if you have a certain physical figure. To quote a friend who is ex-military: Yes for short raids, no for tours or marching. The manufacture is top notch as always. One cannot point this out often enough. Quality and bang for the buck are always correct with Tasmanian Tiger. The load distribution system is very innovative as such and I have not seen anything like it in the tactical gear world so far. 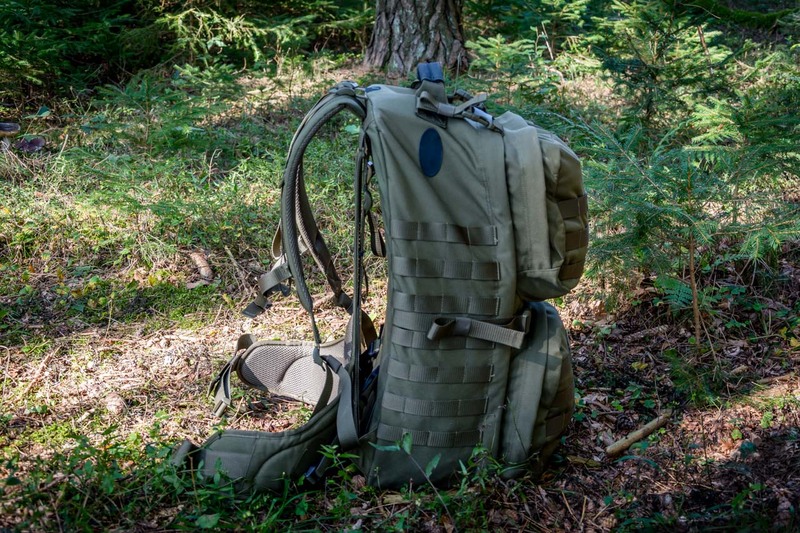 If you do not use military plate carriers (in which you sweat either way) then you should take a look at the X Vent Plus System in any case. Load distribution as well as air circulation are working astonishing well. At this point I would like to say my thanks another time to Tasmanian Tiger who made it possible for me to take a closer look at the pack. Also I want to say my thanks for your patience. The review process for this pack took way longer than I had planned and expected. I sure hope that I was able to give you a better idea of the pack. Thank you for reading – until next time!